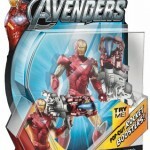 Collider has revealed a packaging mockup for the 2012 Avengers toyline. 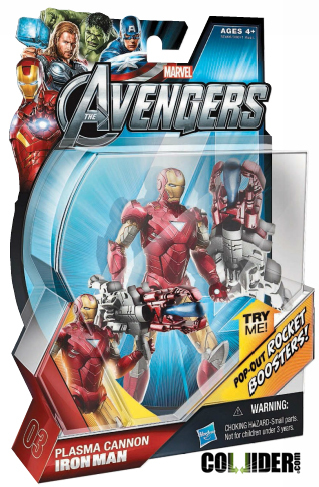 Shown is a mockup of Plasma Cannon Iron Man with a missle launcher that features “pop out rocket boosters”. This is the 3rd figure in the upcoming line. Take a closer look after the jump! Discuss on the Toyark Forums› Views: 7879 › Credit: WindsofHorus of the Toyark Forums! That Iron Man looks way better than the one we got along with Iron Man 2.. I hope its a 6 inch figure! thats got all kinds of pegwarming written on it. Bah, the pic is blocked on my work computer. LOL! I love it! I may have to get Ironman now from that line after all. It's got such a huge Marvel Vs Capcom vibe coming off of him with the BFG shoulder canon only in movie stylized aesthetic. Thats the iron man 2 iron man figure in that packaging. that doesnt look like an actual photo. its a computer mock up. that armour is definitely not the same armour / figure shown at SDCC. that one had bigger bits on the traps, a round chest piece and no silver on the biceps. pardon me if im wrong but thats clearly the iron man 2 iron man in that packaging. It's not the IM figure I'm commenting on. It's the canon. The shoulders are too big for it to be directly repackaged IM2 figure though. It's just a mockup anyway. What caught my attention was the canon though. It's a clear nod to the canon he uses in the MVC games. God I hope you're right that it's a computer mockup.. because handing us that revamped trash after the one showed at sdcc is bull. This should be the biggest action film ever after TFs. Technically it should be the biggest movie event of all time. Having all these blockbuster comic movies put into one big movie (just like the comics), is something we've all dreamed about since forever. They'll sell. If they can make a dime on an entire line of repaints of only one guy, think of what they can do with four guys. Lol. It's a mockup, there's no plastic tray inside. It's definitely not an IM2 figure though either. You can see design cues taken from the one shown at SDCC in this. So at most it's just one of the several IMs we may get in the line alongside Cap, Thor, Hawkeye, Black Widow, Hulk, and Nick Fury. Yeah that's definitely the Avengers IM figure shown before only with a triangle instead of circle. It has no torso articulation just like the Avengers line prototype(same paint app too), matches the shoulders too. Only the triangle bit is different. It's the same pretty much completely as the 4inch one shown at SDCC just with an included MvC inspired shoulder canon. Hey I can see it now, WHEEEEEE!! Anyway I'm most excited about the fact that the Hulk is actually in the artwork there. I figured they'd just go with the Cap, Thor, Ironman pic that they've been using on the current figs that are already on the shelves. the only thing i see here that worries my is theres no distinction on the packaging between comic and movie series, like cap, IM, and XMO. Has their been any confirmation about a comic series for this line yet? I dont wanna have to ignore this line. If there isn't one (comic series) it will be a very big mistake on hasbros part. It would be very un bro of them. I certainly hope there's a comic line, otherwise I may skip it altogether. Who am I kidding? At the very least I'll end up buying the Avengers, even if they ARE just the movie figs. Just what we need. Even more Marvel garbage clogging the pegs. As if there's not enough of the crap already. Why do you even post? Anyway I'm sure that's for the 4 inch figures. My Friends I believe this is for The Avengers 6 inch line. I have had the privilege of getting minor details on it but it is coming! I'm not sure if this is a troll post or a sincere post and what his meaning is but it could be taken that this will be more unimpressive toys that'll be peg warming over time. I mean aren't there enough iron man toys already? Aren't the iron man 2 6" toy line adequate and also haven't we had enough 4" iron men between all the toy lines? I think less on the 3 3/4 inch and more on the 6 inch would be better. Both will be coming but I really hope they do not release as many variants as they have in the past. This one is the 4inch one. The 6 inch line will have more articulation than what this guy does. This is also mock up packaging, possibly not even final mock ups, so who knows on the comic series. They may pass it up though as they did the X-Men line by using MU for that, or even dedicated comic packs. We won't know much until NYCC and the following Toy Fair. I doubt the Avengers line of figures will do as well as everyone seems to think they will. Unless we get a shitload of new molds and a pretty decent variation of characters, they'll clog the pegs.